Our lawn spraying service will make your yard green. Our guarantee is: If the bugs come back between regular services, we will come back at no charge. 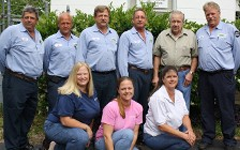 Our Goal is to keep your Shrubs healthy, green and free of pests. We will inspect them every service and treat for pests and disease as needed. Our fertilizer schedule is designed to make sure your shrubs get the nutrients they need when they need it. Crenshaw Termite & Pest Control, Inc. in West Central Florida, has the expertise to provide the fire ant control and elimination services you need. It doesn't just have to be fire ants, either. Here in Florida, we also have ongoing problems with ghost ants. Fire ant control is important because they are so numerous and in so many places. They can destroy farm equipment, kill and consume wild life, and affect us with painful stings. Anyone that has been attacked probably knows that when one ant stings, they all follow suit. This is because when one ant feels alarmed, it emits a chemical (an alarm pheromone) that causes the other ants to attack right away. Fire ants currently infest more that 325 million acres across the Southern U.S. They pose a serious and growing health threat, injuring millions of people each year with their stings. 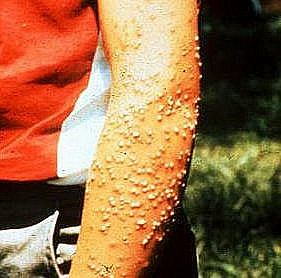 It is estimated that fire ants sting more than 20 million people annually. 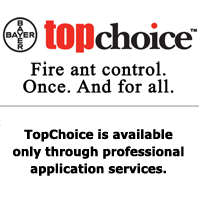 A full-blown colony can number up to 500,000 members. .
To remove these harmful pests, we use TopChoice™, a revolutionary product from Bayer Environmental Science™. This product is remarkable because it cures and prevents fire ants, providing unsurpassed control for one year with a single application. It is the only professionally applied product that offers both an intuitive and preventative solution. Additionally, it creates an exclusive zone that no fire ant can survive. TopChoice is not harmful to humans, pets, or the environment. It contains the same active ingredient used to control fleas and ticks on millions of pets..